I wanted to write about curcumin again. It has become incredibly popular for helping with reducing pain and inflammation in the body- and rightly so- it really does work. New research is coming out all the time confirming its many benefits, which go far beyond just pain relief. Curcumin, the active ingredient in the spice turmeric, has been said by many to be “the most anti-inflammatory herb on the planet”. It is difficult for the body to absorb, however, and in the past, people needed to consume mass amounts of the strongly pigmented yellow spice to be able to get enough of that beneficial extract, curcumin, to make a difference. I love eating turmeric (turmeric is the yellow spice used in many curries), but ground turmeric root is generally only 4% curcumin, so supplements are the best answer if you’re looking to get the benefits reported again and again in the scientific studies. Even supplemental extracts of turmeric or curcumin can be difficult for the body to absorb, which is why there are very specific forms that we recommend. The company Solgar has a branded extract that they use which has been scientifically documented to be one hundred and eighty-five times better absorbed than standard curcumin extracts. If you’re interested, you can search go to our website for more information and the links to the study, or go to PubMed.gov, since I fully agree that it almost sounds too good to be true. We are all about science at Pass Health Foods. Sometimes I think people have the idea that natural products, vitamins, and herbs are a bunch of “hippie nonsense”, but in our store, the products we recommend are scientifically backed by research. There are times when conventional pharmaceuticals are necessary, but if you can find natural products that legitimately work, without the side effects of conventional medicines, it can be a wonderful thing. So, back to curcumin: studies have shown again and again its benefit for pain relief, finding it equal to commercially available pain medications and NSAID drugs, but without the strain those medicines have on the liver. Ibuprofen and other drugs definitely do help with pain, but they are not meant to be taken over and over again on a daily basis. Curcumin is a great alternative, which rather than being hard on the liver, it can actually help with liver function. In addition to pain relief, curcumin supplements have also been shown in research to have impressive results for reducing anxiety and depression, one study even found curcumin supplementation to be as effective as a prescription drug for depression, but without the side effects. New research has also introduced curcumin as a possible aid to weight loss. One thirty day study followed people who were already on a diet and exercise regimen. They found an increased percentage of weight loss in the group who took curcumin, but even more than that was the reduction of body fat percentage for the people who took curcumin vs. the placebo group. Over thirty days the group who used diet and exercise alone had a .70% reduction in total body fat loss, but the group who used curcumin had an average of 8.43% reduction in body fat! Curcumin supplementation has also been linked to a reduction in several types of cancers. In the past, the poor absorption of curcumin supplements was a problem for showing results in human studies, but now with newly formulated extracts like Solgar’s Full Spectrum Curcumin, which have significantly increased the body’s ability to absorb the nutrient, that is changing. Curcumin has been shown to inhibit cancer cells, prevent tumor formation, as well as slow cancer progression, and can be a helpful adjunct to traditional cancer therapies (though as with everything, be sure to inform your physician of any natural products you are taking, especially during cancer treatment). So to sum up, while curcumin is best known for reducing joint pain and inflammation, it has many other scientifically documented benefits. Not all turmeric or curcumin supplements are equal in how well they are absorbed, so at this time, the only curcumin product we truly recommend is Solgar’s Full Spectrum Curcumin, for the simple reason that it has been shown to be so much better absorbed than any other. Since it’s a product we recommend so highly, we were able to work out a deal with the company to be able to offer 25% off on our Solgar curcumin on an everyday basis at Pass Health Foods. Stop by the store for more information, we’d love to help you further. With the dark days of December upon us, I wanted to write about two supplements from Irwin Naturals that can really help with improving mood and easing the stress of the holidays. The first is 5-HTP Extra. 5-HTP is a supplement that helps to boost serotonin in the brain (serotonin is the “feel good” neurotransmitter. Antidepressants like Prozac work in a similar way, which is why it’s important not to mix 5-HTP supplements with prescription antidepressants. Irwin’s 5-HTP Extra is nice because it combines 5-HTP with theanine, an amino acid that’s great for reducing anxiety as well as lemon balm and rhodiola, which work very well for reducing stress. 5-HTP extra is great for people suffering from depression along with stress and anxiety. My husband has used it and found it really helped with reducing stress and anxious thoughts. He was having a lot of stress and difficult things happening in his life (a death of a close family member and other issues), and thought it really helped; in fact, he didn’t realize how much it was helping until his bottle ran out. He said it helped him to feel much less “panicky about things”. 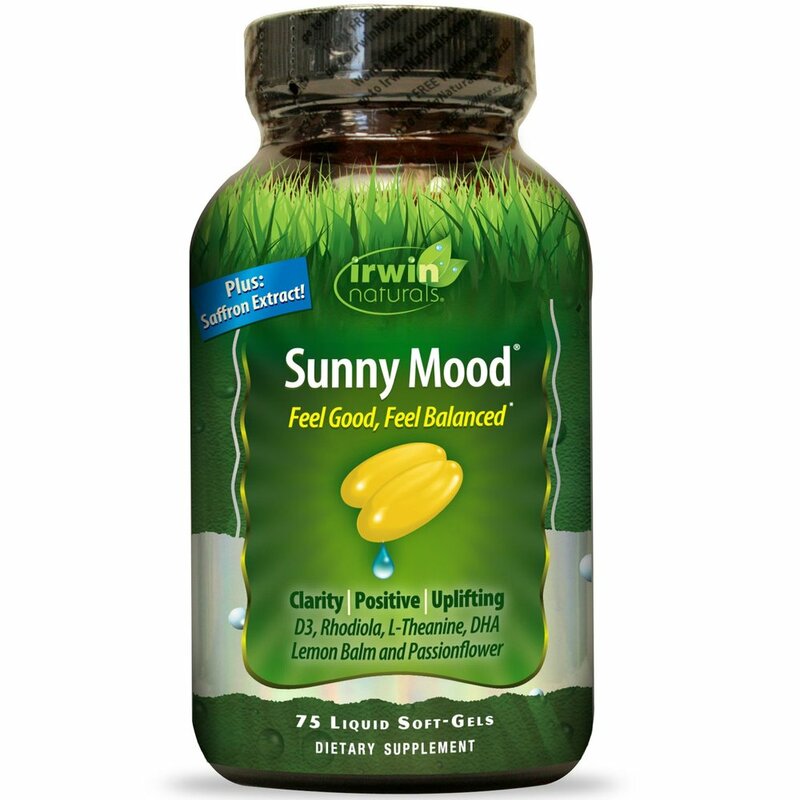 The other supplement I’d recommend is Irwin’s Sunny Mood. It’s a supplement I actually wrote about last December (‘tis the season, I guess), so see this article for more information on the specific ingredients in the supplement and how they work. My husband started taking Sunny Mood after trying the 5-HTP extra. Of the two, he prefers Sunny Mood. He really says he thinks him feel better and more positive. One might even say that it helps to encourage a “sunnier mood”. If you’re having a difficult time with the darker days of winter and need a mood boost, I’d really recommend giving Irwin Natural’s Sunny Mood a try. Both supplements are wonderful and effective. The main difference between the two is that the 5-HTP Extra helps to boost serotonin (similar to the ways that a number of different prescription antidepressants work). Sunny Mood is also effective for mild depression and really does help to encourage a more positive mood. December can be a month of wonder and joy, but for many it can also be a time of stress, sadness, and depression, due to a combination of the holidays and the darkening days of winter where it may feel like you hardly see the sun. Because of this, I wanted to write about a fantastic supplement we have at the store that we love, it’s Sunny Mood by Irwin Naturals. It is an amazing combination of herbs and supplements that help to boost mood, relieve depression and melancholia, and also help with stress and anxiety. Sunny Mood even won an award for being one of the best supplements of 2015 by Better Nutrition Magazine. It is a very unique blend; in fact I have never seen all of the ingredients in one formula before finding Sunny Mood. I have heard of a number of our customers who feel they can see a difference as soon as the first week in taking it, with increasing benefits in the second and third week. Another thing I like about Sunny Mood is that it is helpful for boosting mood and reducing anxiety and stress, but without you feeling out, sleepy or “drugged”. I’ve even heard from customers that in addition to a better mood, they have found themselves feeling less annoyed and slower to irritation- which can be helpful if you’re anywhere near La Grange Road this month! We’re having Irwin Natural’s Sunny Mood on sale this December for 25% off, so I’d really recommend trying it this month, since just about everyone would benefit from a “sunnier mood” during this holiday season! Q: I have a friend who has had depression for a while. I feel bad for her, but it almost seems like there’s nothing I can do. I wondered if you knew of anything natural I could suggest to her that might help. A: Depression is a problem that affects 14.8 million Americans, so your friend is certainly not alone. Sadly many people don’t want to talk about or seek help for depression because they think somehow there is something wrong with them or they are embarrassed by having a problem. People often think (or are given the advice) that they just need to “snap out of it”, but often recovering from depression is not that simple. There are countless prescription drugs that are marketed for depression, and sometimes a prescription may be necessary, but before turning to pharmaceuticals for treatment it would be smart to try some of the many natural treatments for depression. It’s always wise to try to fix a problem naturally before turning to prescription drugs and the side effects that frequently come with them. Deciding to seek professional help is always a good idea, since sometimes just talking to someone who is removed from the situation can help a person to see things in a more positive light. So to your friend and anyone else who is reading this and suffers from depression, let me say emphatically that there is nothing wrong with you, but rather you have a problem that needs to and is able to be fixed. The first thing I would recommend for depression is fish oil. Everyone should be taking omega 3 fish oil, which has been shown in countless studies to have benefits in nearly all facets of health from heart health to lowering cholesterol to reducing inflammation and finally to its use in brain function. The omega 3s in fish oil are a main building block in having proper brain chemistry. Without enough omega 3s, neurotransmitters in the brain can’t work as efficiently, and when your brain isn’t working right, you can feel depressed or anxious. Omega 3s are not manufactured in the body and must be obtained from supplements and diet, though unfortunately the diet of most Americans isn’t very high in heart healthy fish or nuts and seeds that contain omega 3s. One recent study found that higher intakes of omega 3 oils and oily fish reduced the number of occasions that participants experienced depressive symptoms. Our brains are made up of omega 3 fats, so it only makes sense that supplementing with fish oils would help the brain to run better. depression is an imbalance of neorotransmitters in the brain which can act as mood enhancers by helping to transmit signals between brain cells. Prescription antidepression medications like Prozac or other SSRIs focus on the neurotransmitter serotonin and work to make that neurotransmitter stay longer in the body. Supplementing with a high potency B complex can have similar results in the brain by converting amino acids into serotonin as well as helping to synthesize other feel good neurotransmitters. Danish and Dutch studies in recent years have backed up this idea by showing that people who suffer from depression are often deficient in one or more B vitamins. Each of the B vitamins work a little differently to do different things in the body and brain, but its recommended to take a complete B complex rather than just one specific B vitamin because they work best when taken together. Fish oils and B vitamins are the building blocks to have a sturdy foundation of brain health. those who took prescription antidepressants but with fewer side effects. 5-HTP works very well, but it’s important to not mix it with Prozac or other antidepressants known as SSRIs. Another favorite supplement that I would recommend for depression and anxiety is an amino acid L-theanine which is derived from green tea. Theanine works by helping to increase the amount of GABA, another neurotransmitter that promotes relaxation and reduces anxiety without drowsiness. Theanine has actually been shown by researchers to help increase alpha brain wave patterns which are connected to being in an alert, relaxed state. It’s a great supplement to take when you’ll be going into a situation that you know is going to make you stressed and anxious. There are many other supplements that are helpful in treating depression, and I’ve only mentioned a few. Each of us are different and our brains work differently, so sometimes it can take time to find the supplement that is right for you. Because of this it’s helpful to speak to someone who is knowledgeable about different natural supplements. One nice thing about natural treatments for depression is that unlike pharmaceuticals they can be stopped at any time without causing withdrawal symptoms. I hope some of this information can help your friend. There is no reason to suffer depression in silence without seeking treatment. This month I (Carolyn) am writing about one of my favorites. It was hard to narrow it down since I have tons of things I love at the store. I decided on samE, a supplement that is amazing for mood and overall brain chemistry. It’s well known for its benefit to people with seasonal affective disorder (SAD), but is also very effective for general depression and anxiety. I have seen it work in people close to me, and best of all results are seen often in as few as four days. It has been shown in research to be as effective as Prozac, but is faster acting and without side effects. SamE also has side benefits of helping to reduce joint pain, so it’s particularly effective for people with fibromyalgia. SamE also helps to detoxify the liver. For many people a dose of 400mg per day is sufficient, although when people first start taking it, they may take a double dose of 800mg per day to get it in their system faster. For the best absorption and effectiveness, samE should be taken on an empty stomach. Curcumin (the beneficial extract of turmeric) is a wonderful supplement which is best known for its benefits in fighting inflammation and joint pain. The only bad thing about curcumin is that it’s very difficult for the body to absorb. We've recently started carrying a new form of curcumin known as curcumin phytosome which has a much higher absorption rate compared to other forms of curcumin. Curcumin phytosome is different from regular turmeric extracts because it takes the not very well absorbed curcumin and bonds it to phosphatidyl serine, an essential component of our cells which the body can easily absorb. This special superior absorbing form is patented and known as Meriva. One study researched Meriva's superior bioavailability compared to ordinary curcumin. The study, done not on animals, but humans, demonstrated 29-times greater bioavailability compared to regular turmeric extracts. The patented Meriva extract resulted in higher blood concentrations of curcumin from a much smaller dose than with ordinary curcumin. The specialized curcumin extract has been researched with impressive results for joint pain. A recent study compared 1000mg of the Meriva curcumin phytosome with patients taking the prescription joint drug Voltaren (Diclofenac Sodium). The curcumin phytosome group had the same reduction in swelling as the prescription drug group, but without the side effects present in the prescription group. Curcumin has a number of other benefits. One recent study found that curcumin was as effective as Prozac for treating depression. Curcumin has also been researched as a possible preventative and treatment for Alzheimer’s, since it may help to reduce the amount of amyloid plaque in the brain, a hallmark of the disease. There is no doubt that Curcumin has a long list of benefits, so we’re excited to offer a new, better absorbing form. The brand Jarrow has 500mg capsules of the patented Meriva Curcumin Phytosome, which we highly recommend. I feel like I'm constantly recommending Jarrow, but they really do have singular products that stand out, which is why we recommend them so often. I think I have seasonal affective disorder. These dark days are killing me, and I just feel down and like I have no energy to do anything. Do you have any ideas of something natural that could help? I do not want to go on prescription antidepressants. Seasonal affective disorder, or SAD, is very common this time of year as the amount of daylight is so short. Some people who work in an office may hardly even see the sun in the winter months, which makes it very easy to become depressed. First, I’d like to say not to absolutely rule out prescription antidepressants. I am all for doing things naturally, and believe a natural approach should be tried first, but there are times when pharmaceuticals are both beneficial and necessary. That being said, there are a number of supplements which can be very helpful for people with seasonal affective disorder. The first thing that comes to mind, which has been shown to be incredibly effective for people with SAD, is a supplement called SAMe (pronounced “Sammy”) which is short for S-adenosyl-L-methionine. SAMe works by helping to boost the manufacture of “feel good” or mood boosting neurotransmitters in the brain. Research has shown it to be as effective as prescription anti-depressants (some studies have even found it to work better) without the side effects of conventional pharmaceuticals. Instead of having side effects, SAMe has the side benefits of helping with pain and inflammation and also aiding in detoxifying the liver. SAMe is most commonly used for seasonal affective disorder and depression, but is also used effectively for fibromyalgia and joint pain. Many natural mood enhancers can take a bit of time to gain full effectiveness; in fact, some like St. John’s Wort can take several weeks before the benefits are seen. I particularly like SAMe since its benefits are felt quickly, usually within the first week and for some people within just a couple days. SAMe is most effective when taken on an empty stomach. Most people find 400mg daily to be an effective dose. If you suffer from seasonal affective disorder or depression, I would very much recommend giving it a try. I know several people who take it with great success. My one caution would be for people with bipolar disorder, since there has been some research which has linked SAMe supplementation with an increase in manic episodes for people with bipolar disorder. Other supplements which can be of benefit to people with SAD (along with everyone else really), would be a quality omega 3 supplement as well as additional vitamin D. One of the benefits of omega 3 fish oil is its help for brain function and mood. Many people are deficient in omega 3 fatty acids since the body is unable to manufacture them- they must be obtained through diet, so unless you’re eating fatty fish several times a week, or consuming flax or chia seed regularly, you are likely deficient in that nutrient. Vitamin D is great for everyone to take in the winter months, since it is usually made in the body from the reaction of sunlight on the skin. Vitamin D can help with immunity, bone health, as well as proper mental health.